Every Mondays and Fridays of June and July we will be featuring some my favourite food bloggers for the first time here at Ang Sarap. These bloggers are exceptional and served as a big influence of what is Ang Sarap now, so please do visit and follow everyone of them (if you haven’t yet) and I will assure you that you won’t be disappointed. Today we will be featuring Reem from Simply Reem. If its about food styling I guess Reem would be one of the finest ones out there, just look at how she staged all of her dishes it is always colourful, vibrant and full of life. A qualified a fashion designer as well as a chef, these qualities are so evident in her work. Her recipes are always a good combination of flavours, like me she always try to blend flavors from different cuisines together where ingredients from East meets West giving a good fusion of totally different ingredients but that does not mean tradtional items are out of the question as she also post great classics like curries and savoury pies. Reem is not just a food blogger but also enjoys sharing some DIY and Home and Garden section once in a while, so if this is one of your interests you will definitely enjoy reading her articles while drooling over her recipes. Very powerful phrases and these are all true so if you love food just follow your passion and cook to your hearts desire. Hello everyone, my name is Reem and I am the author/photographer behind the blog Simply Reem. I want to start by thanking Raymund for inviting me to his absolutely amazing and wonderful blog Ang Sarap. Blogging has not only introduced me to many different kinds of cuisines and recipes but it has also introduced me to some very talented and amazing people and Raymund is one of them. I still remember the first time I visited his amazing blog; I immediately fell in love with his beautiful photography and delicious recipes. His passion and creative approach towards food can been seen in each and very recipe on his blog. I absolutely love how he brings different flavors from around the world together. Once again thank you Raymund for having me over, it is an absolute pleasure!! Coming back to the post, today I am going to share with you all, the recipe for one of the most loved Indian stuffed pastry, “Samosa”. These triangular pastries are one of the most eaten and cherished snack in India, anywhere you go you can always find a snack house or a road side vendor selling them. Stuffed with many different kinds of filling and then deep fried, samosa is the kind of indulgence that is not only delicious but addictive too. Samosas are usually fried just before serving and served hot with some form of chutney or ketchup. You can use any choice of filling from the traditional ones like potatoes to beef or cheese. Today I am using a spicy chicken and potato filling for the samosas. You can serve these as a snack of even as a little savory pies for lunch or dinner. To reheat them the best way is to place them in pre-heated 365 F oven for 10-12 minutes. I hope you will give this recipe a try and enjoy it. Oil or Unsalted Butter or Ghee – 4 Tbsp. Carom Seeds or dried thyme – ¼ tsp. Water – 6 – 8 Tbsp. chilled. Chicken ground – ½ lbs. Potatoes – 3 medium size; boiled and chopped. Ginger – 1 tsp. finely minced. Garlic – 1 tsp. finely minced. Jalapeno – 1 finely chopped. Cilantro – ¼ cup finely chopped. Lemon juice – 1-2 Tbsp. Oil – 2 -3 cup for deep frying the samosas. Green Chutney, to be served with. Place the flour, oil, carom seeds and oil in a food processor and pulse few times until it is well mixed and the mixture looks like fresh bread crumbs. With machine running, start adding ice water slowly until the flour gather into a semi-firm ball and stops sticking to the sides of the work bowl (start adding by 4-5Tbsp of water and add more very carefully if needed). Remove the dough from the work bowl and knead on a clean surface for about 4-5 minutes or until dough is smooth and pliable. Shape it into a ball, rub it with oil, cover it with plastic wrap, and keep it aside for minimum 45 minutes to rest. This dough can be made up to 2 days in advance, tightly covered and refrigerated. Make sure to bring it to room temperature before rolling out and shaping the samosas. In a large mixing bowl add ground chicken, minced ginger and garlic and chopped jalapeno. Mix well. Heat oil in large non-stick wok/skillet and add the chicken mixture to it. Cook stirring over medium-high heat until the meat is golden and completely dry, about 6-8 minutes. Add the chopped boiled potatoes and salt and pepper. Mix well, finally add the dry roasted spices, lemon juice and chopped cilantro. Give a last good stir, remove from the heat and let it cool down completely before using. Lightly oil you palm (to prevent the dough sticking to them); divide the dough into 12 balls. Set aside on a plate and cover with damp towel. Working with each ball at a time, flatten it into a disc, coat well with dry flour and roll each disc into a 6-7 inch circle or oval-shape of uniform thickness. If the dough sticks to the rolling pin, coat it with little dry flour. Cut the circle/oval in half to make 2 semi circles or oval shape. Dip a fingertip in water and moisten about ½ inch in, along the straight edge. Pick up the two corners and place one over the other along the straight edge, then press along the straight edge to seal making a cone. Make sure to pinch the point of the cone to seal it well too. Alternately – You can also fold the shapes in half, sealing the straight edge to make a simpler cone. Fill the cone about ¾ full with the filling, moisten the inside edges of the mouth of the cone with water and press them well to seal. (All seams must be well sealed. If they are weak and open up the filling will fall out while frying, also the oil will seep into the pastry and the samosas will be greasy and heavy). Repeat with all the balls of the dough, set the samosa’s seam side down on a baking tray in a cool place loosely covered. The samosa can be assembled ahead and stored refrigerated up to 8 hours. Let it come to room temperature before frying. Heat the oil ( 2 ½ - 3 inches of oil ) in a wok or skillet over moderate heat to 350 F. Place samosas in the wok as many as it can hold at one time without crowding, and fry turning them few times with a slotted spatula, until crispy and golden on all sides (5-6, minutes). Make sure to keep heat moderate and if the samosa browns too quickly it means the oil is too hot, lower the temperature. Once done; drain the samosa’s on paper towel and then serve hot along with Green Chutney or Ketchup. Cilantro – 2-3 cups, coarsely chopped, including soft stems. Jalapeno – 1 (deseeded, optional). Lime/Lemon juice – 2 Tbsp. In a blender, blend everything together until everything is well blended and smooth. You can add a little water to help it blend smoothly. Serve. This chutney can be stored refrigerated in a non-metallic container for up to a week. Reem’s samosas look as beautiful as I’m sure they taste. this is a great feature on your blog. I know Ray but I have to check out Reem. She sounds like a talented blogger not just on food but on DIY projects around the house too… another area that is right up my alley. i love her food styling and my favorite is the first pic. Have a great week Raymund. I’m so happy to read your comments whenever you drop by! I love samosas! I often eat them when dining out at Indian, but have never made them at home. It’s that fear of frying thing – oh, I know how to do it and it’s actually quite easy, but always seems like a production. I’ve got to get over that, if for no other reason I can enjoy these! Great recipe – thanks so much. I love her recipes and writing style. Her photography is breathtaking. I really appreciate your kind words, I hope you will give this a try and enjoy them. Thank you so much for having me over, it is absolutely a pleasure for me being on ur wonderful space today!!! Your passion for food always inspire me and ur recipes always always makes me Hungry!!! One of my very favorite snack….love it….pics are tempting and yum stuffing….. Very nice post! I’ve never tried samosas! Going over to Reem’s blog now! This post deserves a reblog. I love this feature. Thanks AngSarap. Good to see you here Reem. Your samosas look very tempting. 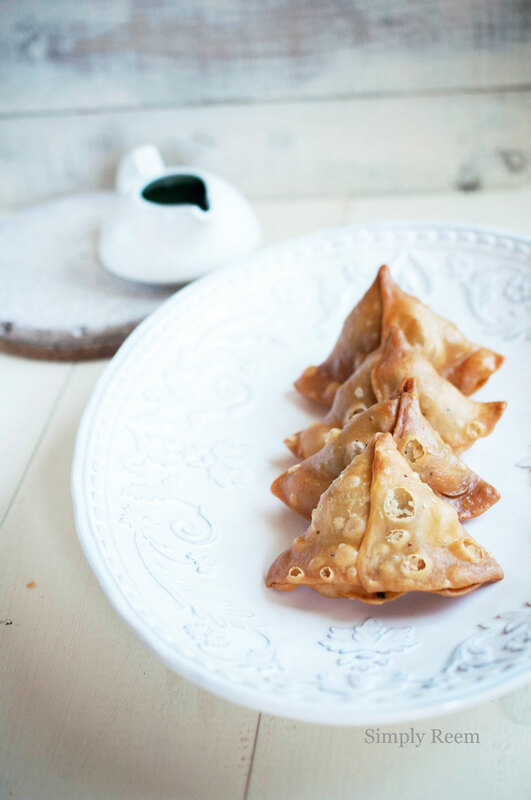 I just love samosas, what a great guest post! I had some potato pea samosas today but they were of the frozen variety hehe! The green chutney alone makes me drool so badly! Next door to my workplace is this Indian and Pakistani take out restaurant, and when I was pregnant, I was eating all kinds of spicy stuff from them. Samosas is one of them…always with green chutney! 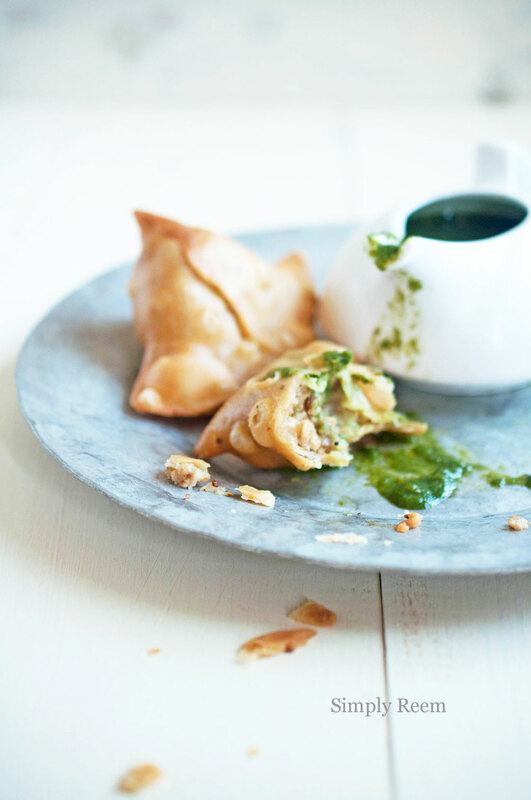 Great samosas with green chutney – Reem, you did it again. You always make delicious food and take gorgeous photos. Thanks for introducing Reem to us. Just lovely these Samosa are perfectly shaped and lined up on the dish and the green chutney sounds delicious. Oh my goodness do these look good! And the chutney sounds fabulous. Beautiful guest post! Reem is one of my favorite bloggers and people around. Reem, those samosas look incredibly tasty. I love your recipe, pics as well as your presentation. What can I say. . . Reem’s photography is synonymous to beauty. Thanks for introducing me to Reem’s blog Ray, I noticed you even posted 2 of her dishes photos… they are both gorgeous and I’d be having a hard time picking one too! Ok I’m going to attempt this. I actually just tried to make samosas and my dough (which I made in a food processor) was a complete disaster lol. We ended up eating the filling as the dish with some rice. Those samosas look perfectly filled and crisp.